As for the economy and jobs, if we're doing so great why did the parent companies of 465 stores -- from Gap to J.C. Penney, Footlocker and Victoria's Secret announce in the last 72 hours they are closing? All but Footlocker said they missed their last earnings goals. That makes 4,300 store closures just in 2019 -- and it's only March 2. The retail apocalypse seems real to me, and that's a lot of jobs to lose. Do his under-informed rally attendees care? Of course not. They just want to shout "lock her up" like it's 2016 again. f you watched that two-hour speech, which was genuinely too cuckoo for Cocoa Puffs, and all you could muster was an article that says "an energized trump attacks Democrats," please do yourself and everyone else a favor and find another line of work. I feel like I'm Alice Through the Looking Glass and that article sure makes me feel that way. they don't want anyone putting a rubber on the willy of the Free Market for any reason. 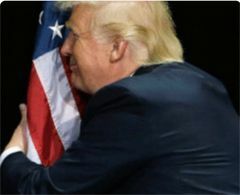 It is not the first time he has molested a flag but it is still a jaw dropping image. If that picture is not proof positive that the lights are on but nobody's home, I don't know what is. A patriotic ME TOO moment. Wasn't huffing something involved in all that? I think it is a fitting comparison given what we have heard about Trump and adderall. And by watching Molly's Game I came to understand that people crush and snort adderall to defeat the time release properties. No Hitler comparisons here or any libelous accusations. ...that Drumpf (and Drumpfsters) has (have) no understanding of how birth control works. I think tRump is just trying to channel Foster Friess but using the wrong pill. to deflect detention from his 2020 campaign which has been geared up and running in all his hotbed places for months. His former website builder and digital director from 2016 (hand picked by Jared) is in charge, with Eric Trump's wife right up there with him as the "face" of the campaign. That's where people should be directing their attention, not this crazy antic stuff he's doing on purpose. Of deflectin to do. The next few months are going to be something. With all the horror it's a great time to be alive. People will be reading about this presidency as long as there is history. Had we as a nation dealt with Nixon's criminality as we should have, and not have to suffer from Ford's bullsh*t "long national nightmare" nonsense, then the world we live in today would be quite different. The Republican Party is a fully criminal organization that has never had a whit of interest in civil governance. The Dems are financially corrupt and devoid of almost all political imagination, but the Repubs are the mafia. The end. The entire political class has been a fraternity/protection racket for.....well, forever. With the goal of maintaining power while preserving a veneer of rule of law and represenative government. Trumps biggest mistake, and possibly the one good thing he ever did in his miserable life, was to rip that mask off. It's the one thing that can not be tolerated. By the brotherhood. Besides a brand new US Constitution? For example, according to Article 5 of the current document, there is no way an amendment can change the current undemocratic body known as the US Senate. Much more real choices in elections are needed. would be almost impossible absent something like a second civil war and splitting the US. The Senate was set up the was it is so smaller states would join the union, something they would not have done other wise. Many of the founding fathers had a real problem with unfettered democracy and thought there should be buffers between the voters and which pols would be in control of the government. Not to mention the constitution was set up so it would be very hard to change with a simple majority; it would take a super majority. Maybe the biggest difference between when the constitution was written and now is how big government is viewed. Back then the government was suppose to provide for national defense and ensure individual rights; nothing about the many social programs that exist now. There are still lots of sparsely populated parts of the country (that make up most of the land mass) that want less government; not more. While densely populated places like big coastal cities want bigger government. In the 1960s Daniel Borstein wrote a book, The Image, which described, among other things, how the US had changed from having a single national purpose to multiple national purposes; many of which were in conflict. Frankly, I could care less that "many" of them didn't like democracy. The same white, male landowners who didn't allow women or African Americans to vote wanted to keep power to themselves. Not surprising, but it shouldn't determine our interpretation of democracy today. Please do not skip over the role of preserving slavery in creation of the electoral college. Small states were by and large slave states and had their voting population increased by adding three fifths of their slave to their voting (Electoral College)strength. Almost half the population of the Carolinas and Georgia were slaves. The first 5 presidents of the US were slaveholders. "The Senate was set up the was it is so smaller states would join the union, something they would not have done other wise." endlessly pointed out the Southern states would have had more voting power if slaves were counted a full citizens instead of 3/5 of a citizen. Free states compromised with slaveholders in an attempt to get them to join the US. Nonetheless, eighty years later these states fought to destroy that Union and today still have an unbalanced influence on our polity. I would include a Bob Barr for the Bush 1 pardons. Former Rep. Bob Barr (R-GA) was the angry and moralizing troll who wanted to impeach Bill Clinton for having gotten caught engaging in the sort of extramarital foolishness that Bob and many other Republicans were also doing at the time. What a country we live in, eh? In Trumps bread and circuses is money. That would be that roughly 40ish percent of the country seems totally fine with it. is a mighty toxic drug? People are so afraid of change they will embrace insanity? They're fine until something affects them? ..said was a total lie, but Fake Media won't show it. I am an innocent man being persecuted by some very bad, conflicted & corrupt people in a Witch Hunt that is illegal & should never have been allowed to start - And only because I won the Election! Despite this, great success! I love the part about how a proven liar proves his innocence. the more he screams this kind of thing the more you know something is going to happen. "the other" that he's referring to. use the expression "witch hunt" again after Trump is gone. He's drained it of all significance. last night I stumbled on a very interesting and long discussion of the Salem witch trials and the psychology that helped it happen. No need to over emphasize the obvious. The whole thing is worth the time. Before bed time would be better. about the reasons for the Salem (and other) real witch hunts, read the works of my late, great professor Paul Boyer and others (his work leads you, as good scholars do, to others). It was about money and misogyny. Timely. Actually seen that name before. That episode has always been something of an obsession with me. Sounds trite but I'm still waiting for a dramatization, in spite of the zillions done, that is a real and true telling of that story. If I developed premium miniseries I would be all over that. He wrote his now-classic play "The Crucible" in response to the McCarthy-era witch hunts, but it's long since taken on a rather timeless quality. The 1996 movie version with Daniel Day-Lewis, Joan Allen, Paul Scofield and Wynona Ryder was actually quite good. it was a commonly held belief that if you doubted the existence of sorcery and the summoning of malevolent spirits, you were calling into question the infallibility of Holy Scripture and therefore calling into question the very existence of it's infallible author. So you could be treading on very thin ice if you had a mind to attempt to defend the accused by injecting 'common sense' and rationality into the discussion. a few nights ago about 1690s Boston cloth merchant and pamphleteer Robert Calef, who was Cotton Mather's chief nemesis in the wake of the witch trials. In the ensuing war of words and charges, Calef was the "have you no decency, sir?" guy of the 1690s, who contributed to exposing the hysteria for what it was. The author also wrote a biography on Cleopatra. Oculus told me about that book and I had to buy it twice. Gave it away both times to another woman. Amazing book. I'll be buying 'The Witches'. And try not to give it away to another woman when I'm done. My neice stayed with me after Christmas and I wished I had Cleopatra, so I could give it away to her. But that whole thing grabs me. Defense of Constitution Begins Now: Nadler Subpoenas Everything. Congressman Nadler sent out document requests and letters to sixty (60!) people in and around the Trump Organization, slash White House today. People like Allen Weisberg are going to be consulting attorneys very soon about how to save one's own azz by answering questions honestly, while invoking the 5th Amendment quite liberally. Ha ha, I said "liberal." On the list. Waiting for mine. For choosing to " look forward not back"
You find where it goes!